This summer, NEOCH had 5 summer interns: Asha Ravichandran (CWRU), Connor McIntyre (JCU), Gillian Prater-Lee (CWRU), Shivani Govani (CWRU), and Zach Chapman (JCU). We asked each of them to write a brief reflection on their time at NEOCH! Gillian Prater-Lee (rising junior at CWRU): When I first stepped into the NEOCH office, I liked what I saw. The room was filled with people laughing, comfy couches, and loads upon loads of donations stacked all around. This was the type of environment that I wanted to work in: a community of kind and laid-back people working together to fight a difficult battle. These people have made doing the difficult work of outreach, advocacy, and organizing against oppressive systems an enjoyable time. In fact, the people and experiences I have had at NEOCH have shaped me as a social justice activist, but, more importantly, as a person. I’ve worked in the past to organize around affordable housing, but NEOCH gave me the human perspective on how unjust systems shape people’s lives by systemically denying them housing. Talking to and working with NEOCH has made me a better advocate and, I’d like to think, a better person. My favorite project I worked on is the Funeral for Affordable Housing protest on August 2nd. This event will allow NEOCH to go out into the greater community and amplify the voices of people experiencing homelessness and others who have had struggles with finding quality, affordable housing. The event will do what I see as my role in advocacy: centering the voices of people oppressed by systemic forces to create change. This internship has strengthened my resolve to advocate for affordable housing and against gentrification, and I hope to keep to work with NEOCH in the future. Zach Chapman (rising senior at JCU): Ever since I started volunteering with John Carroll’s Labre program, my goal has been to eventually work for NEOCH. I really wanted to discover why so many people remain almost systematically homeless. I wanted to learn the meaning behind the word: poverty. I assumed that NEOCH only served people who were on the streets, I was wrong. I also assumed, given my professor’s reactions to my never-ending desire to work at NEOCH, that there was going to be a little bit of rabble-rousing from NEOCH. We were going to push people to get things done! I was excited! I was ready to end homelessness in 10 weeks. While, I didn’t achieve this goal in my time at NEOCH, I did learn so much about the systems that are set in place to prevent people from really getting out of the cycle of poverty. Poverty seems to be a word which induces fear into the hearts of many. While the typical picture of someone living in poverty is a drug addict or someone who is lazy, I can tell you this is simply not true. Many people who are homeless just lost their job. Many people who live in poverty have just been stuck in the cycle, their mom, and their grandma, both lived in penury, and they never got the resources needed to get out. So, while it is easy to be afraid of those who live in the homeless shelter or under the bridge, I can assure you, they are people just like you and me. They are people, with limited resources. It was truly shocking to me to learn about how limited the resources are to those who are experiencing poverty in Cleveland. Many rely on non-profit organizations to get them their basic human needs of; food, water, and shelter. I also was shocked to realize how many people in Cleveland live in poverty. Through penning a Homeless Bill of Rights, going on outreach, attending protests, registering people to vote, and various other projects, I have been able to better grasp how systems of poverty affect many residents in Cleveland! I have learned that NEOCH truly cares about ending the stigma around the word poverty, and fights for the rights of all who are poor in Northeast Ohio. I have thoroughly enjoyed these life changing weeks at NEOCH. I will miss seeing all of you, but if you ever want to say “hi” just look for me around town and at Malachi’s on Friday nights! I’m hoping that one day we will live in world where poverty no longer exists. Even more I hope the whisper of poverty is no longer the final nail in a coffin of grief, but a signal of help to be given to those suffering. Let’s fight the system together! Connor McIntyre (Rising Sophomore at JCU): I am thrilled with how well my internship at NEOCH has gone this summer. My eyes have been opened up to so much and I have found a passion for helping the homeless. I have had so many different opportunities while working at NEOCH, such as weekly outreach, attending and organizing different events and meetings, and so much more. I have also done research this summer and found out a lot about the status of low income housing and homeless students in Cleveland. I want to thank Chris Knestrick, Executive director at NEOCH, for being so hospitable and opening my eyes and heart to the homeless community. The most enjoyable project I have worked on is the startup of a potential Homeless Bill of Rights. Chris called the interns to come up with ideas and really got behind us and got us going on drafting the Bill of Rights. I also want to thank the NEOCH staff and the other interns at NEOCH for being so awesome and for being super supportive and charismatic each and every day. I could not have asked for a better internship experience than I have gotten this summer with NEOCH. Shivani Govani (Rising Junior at CWRU): My time at the NEOCH this summer has been incredibly rewarding. Under the supervision of Chris Knestrick, the executive director, I was able to help sign up homeless individuals for the CMHA Housing Voucher Choice program, help create a digital version of NEOCH’s street card that will help many homeless and low-income individuals, and plan a protest addressing the lack of affordable housing in our community. I also learned more about prominent issues in our community such as lead poisoning, gentrification, and fair housing. Additionally, I was able to form relationships with homeless individuals through outreach. I am incredibly thankful for my time at NEOCH and the wonderful staff members and fellow interns who made my time here very memorable. Asha Ravichandran (Rising Junior at CWRU): Working at NEOCH for the last few months has been incredibly rewarding. This internship has given me the opportunity to work on several projects with my fellow interns that I hope will lessen the impacts of systemic homelessness within our community. From attending a Poor People’s Campaign protest to planning a direct action centered around affordable housing to drafting a Homeless Bill of Rights, I have learned so much about homelessness advocacy. I’ve met great people in the community through registering people to vote and going on outreach trips. And throughout it all, I’ve had the pleasure of working with the wonderful interns and staff at NEOCH. Although I started one week later than the other interns, I felt immediately welcomed by everyone as soon as I stepped into the office on my first day. My internship experience has been so fulfilling, and I hope to use the knowledge I’ve gained about social justice and systemic inequalities to continue serving my community. The Poor People's Campaign, a national nonviolent activism movement, professes to do the unheard of today: create an intersectional and comprehensive class-based social and political movement to fundamentally reform the power structures that control our lives. This campaign was inspired by a 1968 movement of the same name led by Martin Luther King Jr. Rev. Dr. King envisioned a “new and unsettling force” that would address far reaching social, economic, and political inequities. Today, activists across the country have commemorated Dr. King’s legacy by reviving his movement. The campaign is unique within the current wave of post-Trump election activism because it clearly seeks to address how the capitalist system oppresses the poor. Instead of taking socioeconomic status as simply one of many intersectional identities, the Poor People's Campaign centers the role of capitalist exploitation of the poor and working classes and then layers on other oppressive forces. The campaign also seeks to redefine our country’s distorted moral framework. In a society plagued daily with ethical atrocities, the Poor People’s Campaign’s commitment to morality throughout its advocacy for the poor is a refreshing and necessary addition to today’s political climate. Learning about the campaign’s mission reaffirmed my commitment to the work I do at NEOCH. While we at NEOCH are focused on ending the cycle of homelessness, we recognize that this is but one component of the epidemic of poverty that plagues our communities, especially in today’s political climate. I particularly appreciate the movement’s aim to redefine our country’s “distorted moral narrative.” Despite the intensely bipartisan nature of today’s politics, it’s important to realize that the issues the Poor People’s Campaign addresses transcend party lines: as the campaign puts it, targeting systemic inequalities is not a question of right vs. left; rather, it’s a question of right vs. wrong. 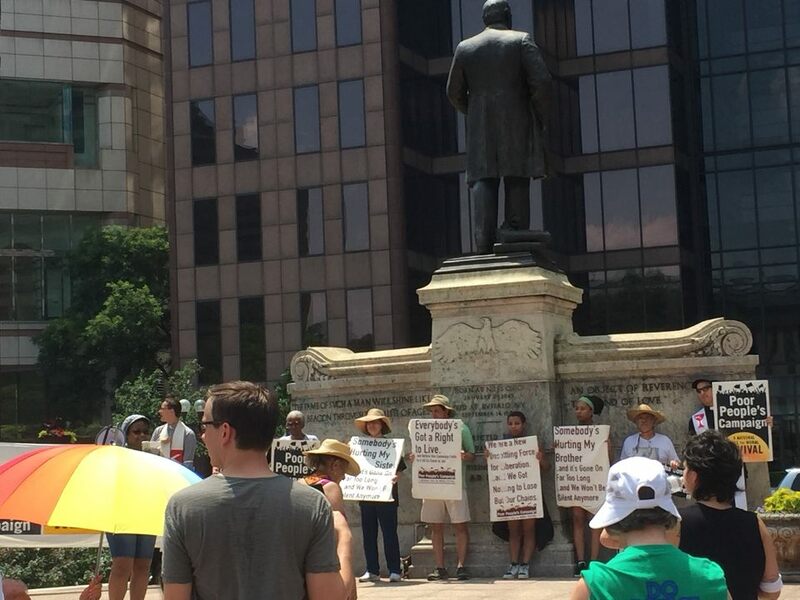 Monday’s rally began with a few speeches next to the William McKinley Monument across from the Statehouse. One speaker, a full-time employee of Ohio State, noted that she is forced to live paycheck to paycheck—in short, one emergency expense away from a financial crisis. Others discussed the unconscionable ways our government devastates families by separating children from their parents. Leaders of the protest then invited us to write the names of those we had lost due to government- and police-related violence on a banner painted to resemble a brick wall. Our next action was a “Jericho March” around the Statehouse. The approach was inspired by the story of Joshua and his men marching around Jericho seven times, causing the city’s walls to tumble down. During Monday’s march, we walked twice around the Statehouse, carrying the long banner. The first walk was silent, accompanied only by the slow beating of drums. The second time, however, protestors broke into rousing songs and chants, such as “O-H-I-O, Poverty Has Got to Go!” and “Fight Poverty, Not the Poor!” After our march, we watched as six of us who had planned to be arrested blocked State Street. As they were escorted into police vehicles, our chants grew louder, for their arrests represented a distinct message: that we will no longer tolerate the marginalization of the poor in this country. It was exhilarating to be part of such a passionate movement that advocated for the rights of the dispossessed in our community. The Poor People’s Campaign does not end here; they have planned a mass rally in Washington, D.C this Saturday, June 23rd. These rallies represent only the beginning of the campaign’s attempt to create a better, more moral society. We at NEOCH hope that their efforts will help to tear down the walls of injustice and lift up the dispossessed. This past Saturday I had the opportunity to travel to Washington DC with a group of Cleveland poor people and activists to participate in the final day of 40 days of direct moral action on places of power. Our two vans left Cleveland at 2:00AM to head to DC. Once there, we joined scores of people in the national mall to hear speakers of all identities (though predominantly poor activists) discuss poverty and inequality, systematic racism, ecological devastation, and the war economy and militarism. We then marched on the Capitol building while crying chants like "No justice- no peace," "From Palestine to Mexico, all the walls have got to go," and "Whose streets? Our Streets!" and iconic, ageless songs that were likely sung at the original Poor People's Campaign like "A Change is Gonna Come" and "Free at Last." I am still processing all of these and more moments, but this weekend gave me hope that our deeply flawed capitalist society can be forced to change so that all people can be given a life where they can fully recognize their aspirations, hopes, and dreams. I am thankful for all the beautiful people that shared their stories and energy over the course of the day. The National Low-Income Housing Coalition has recently released their 2018 Out of Reach report, which takes an in depth look at the correlation between wage and housing issues for low-income communities. The statistics cited in this piece all pertain to Cuyahoga County. Renting is the most viable option for people living paycheck to paycheck, but the numbers show it is still not that viable of an option for many. The problem becomes evident when looking at the gap between someone who makes minimum wage($8.30/hr), and the mean and median renter wage. A person making the mean($15.38/hr), and even median wage (roughly $14/hr), can comfortably afford to pay for a 0-bedroom apartment at Fair Market price($529/mo). While the mean and median wage earners can comfortably afford a 1-bedroom apartment, someone working full-time on minimum wage still falls $100 short per month for a 0-bedroom apartment, let alone a 1 or 2-bedroom apartment. The lack of affordable housing and low minimum wage work together to create huge problems. Not only does it create more homeless people, but people who are currently homeless will struggle to afford housing and escape homelessness. There will continue to be a steady rate of homelessness if the price of rent or the minimum wage does not change. Public Transit Round Table: Join us. In a 5-4 ruling in Husted v. APRI, the U.S. Supreme Court today upheld an Ohio voter purge practice that removes infrequent voters from the registration rolls. The decision creates a danger that other states will pursue extreme purging practices to disenfranchise millions of eligible voters across the country. Dēmos and the ACLU of Ohio first filed suit on behalf of Ohio APRI, NEOCH, and Ohio resident Larry Harmon in 2016, prevailing in the circuit court and securing relief that protected the right to vote for purged Ohio voters in November 2016 and every other election in the state to date. “Voters should not be purged from the rolls simply because they have exercised their right not to vote. This ruling is a setback for voting rights, but it is not a green light to engage in wholesale purges of eligible voters without notice. ",” said Dale Ho, director of the ACLU’s Voting Rights Project. A New Era for the Women's Shelter...Trend or Outlier? NEOCH has long documented the history of abuses and neglect at the Norma Herr’s Women’s Shelter. “Abusive”, “toxic”, and “predatory” are just some of the words that have been used to describe the inhumane conditions there. Thus, it is with great optimism that we regard the momentous occasion of this past Tuesday, May 1st: the day the YWCA began operating Norma Herr Women’s Shelter full-time. First and foremost, we want to acknowledge and respect the struggle many have endured to reach this point of optimism. For over a decade, NEOCH has organized hand-in-hand with the women of Norma Herr, outreach workers, and service providers to build awareness of the issues at Norma Herr. Particularly, we want to honor the courage and bravery of the many women who spoke out against the terrible conditions at the shelter despite being fully aware of how speaking out could negatively affect their stay at the shelter. We are all indebted to the bravery of these women and other activists. Second, thank you to Margaret Mitchell, Teresa Sanders, Nicole Evans and the rest of the team at the YWCA. Their leadership, courage, and love for our community has answered NEOCH’s long call for new service provider at the women shelter. NEOCH believes that the YWCA will bring a client-centered approach that will respect the dignity of all the women that walk through the doors. It is deeply appropriate that an organization whose mission it is to “eliminate racism and empower women” would have the courage to redo how services are provided to women in crisis in our community. We know it is not a easy task to run the women’s shelter, but is is one of the most important in our homeless services system. There will be complaints, complications and very little thank you’s from this point forward. There will also be those that are wanting to partner with you and see you succeed. Count NEOCH as one of these partners. So before NEOCH receives our first “official” complaint and continues our advocacy work, on behalf of the NEOCH and our members, thank you. Thank you for your work, your mission, and your courage. The YWCA’s transition into being a new provider comes at a time when NEOCH is under new leadership. 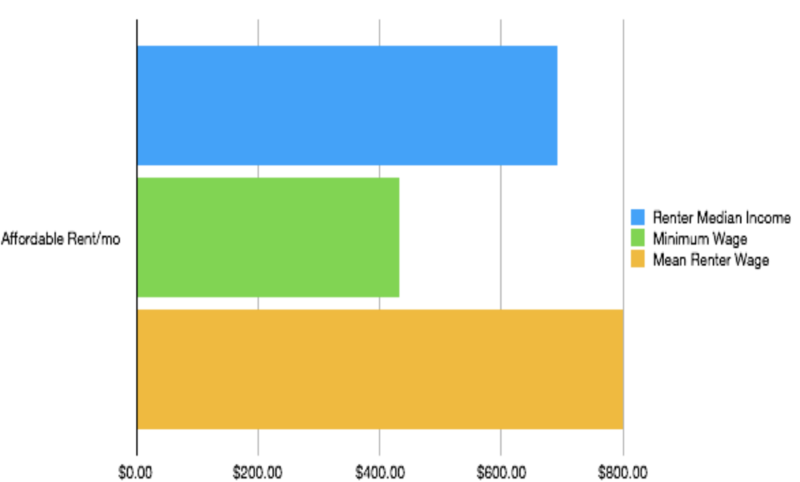 I started this position in July 2017 and have been running ever since. I have about 10 years of experience volunteering at the Catholic Worker drop-in center on the west side of Cleveland, and I still volunteer there in the evenings. One of the saddest realities is when women who are experiencing homelessness ask me for a ride to the place where they are going to lay their head that night. I ask them if they want to go to the Women’s Shelter and they tell me, “no way,” and would instead have me drop them off under bridge or at another precarious place. This has happened countless times in the last 4 years. Thus, during my first few months as the director of NEOCH, I sat down with both Margaret Mitchell and Teresa Sanders to talk about the YWCA taking over operations once the County had opened the bidding process. I understood that this was an opportunity to rewrite how services are provided to women who are experiencing homelessness in our community. I have gone to county council multiple times to support your work. I have sat in meetings with elected officials to support this transitions. We are on board the YWCA train that is coming to Payne Ave., and we want to build with you, as we want you to succeed to providing the best services possible. While we are excited and hopeful about the fact that YWCA is running the shelter with increased resources, we want to acknowledge that it is not enough. The needs continues to grow and more resources must be provided to continue supporting people facing a housing crisis. We have a lack of affordable housing in our community. According to the National Low Income Housing Coalition, a person needs to make $15 a hour to afford a 2 bedroom apartment. This has led to to a increase of 24% in family homelessness over the last two years. Furthermore, a homeless prevention program is almost non-existent in our community. Everyday, outreach workers and case managers scramble to help families and individuals pay rent and utilities so prevent evictions. They jump from organization to organization asking for support, trying to pull enough funds to prevent someone from becoming homeless. Cuyahoga County had 18,385 evictions in 2017 - mostly for non-payment of rent. Without a comprehensive plan to develop Cleveland without raising rents, we will see more and more homeless, and thus more and more (avoidable) stress placed on the shelter system. We need to make sure that financial resources are available to the people that need them most. There seems to be plenty of money. Sadly, the county seems to have unlimited funds for other projects that don’t benefit poor, the near-homeless with insecure housing, and people experiencing homelessness now. The county gave a 2 million dollar loan for this high end apartments that will rent “for 1,300 to 1,600 a month.”. The County structured a $140 million deal to help billionaire Dan Gilbert pay for stadium renovations. And who knows how many undisclosed millions of dollars–in the form of tax cuts–were offered to Amazon in the attempt at obtaining “HQ2”? When it comes time to supporting issues for those experiencing homeless, the County needs to stop looking in their couch cushions for spare funds but rather open their wallets to provide substantial resources. This struggle is a reminder that we are indeed a welfare-state, except our welfare often goes to billionaires instead of those that really need it. We are however excited that the County did eventually offer more funding for the Women’s Shelter. We only hope that it represents the beginning of a trend of vibrant support for social services for families and individuals experiencing homelessness. This is an optimistic moment for Cleveland’s homeless, and we need to build on this momentum. What can we do to help make your homeless experience be as brief as possible? To empower women to receive the institutional services that they are entitled to overcome the homeless experience, trauma, physical abuse, substance abuse, and self-suffering. To increase resources that are available to women in the shelter to establish independence in the community. We released our 2017 Annual Report. Please take a look if you have not yet seen it. The report highlights our work, demonstrates the facts of homelessness in our community, discusses our financial health, and thanks our supporters. 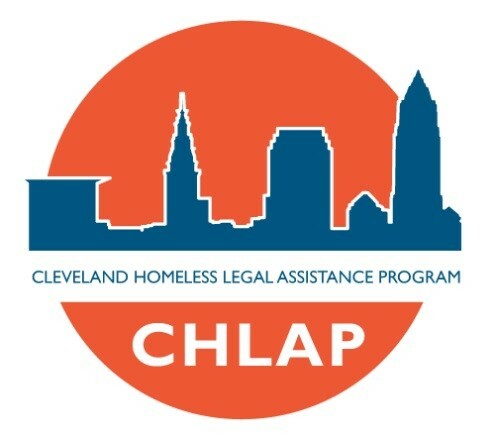 The Cleveland Homeless Legal Assistance Program (CHLAP) is a program of the CMBA. It works with the Northeast Ohio Coalition for the Homeless (NEOCH) and homeless shelters in the area to focus on the legal issues that are of concern to those in Cleveland who are experiencing homelessness or are at-risk of becoming homeless. The program offers an important service to the individuals in need by providing access to justice through brief advice and counseling clinics at regularly scheduled times in shelters and social service sites where they reside or gather for meals and other services. Just the Facts: Homeless and Poverty in our community. This is 2017 year data and speaks to the reality of poverty and homelessness in our community. Looking at who is impacted by homelessness, we see that 70% of the people in shelter identify as black and that family homelessness has increased by 24% since 2015. This editorial, by Director Chris Knestrick, was published on Cleveland.com on the day of the Voter Purge case at the US Supreme Court. NEOCH was one of the plaintiffs in the case. CLEVELAND -- Every vote counts -- and our democracy is strongest when each voice can be heard, and every eligible citizen can cast their vote. 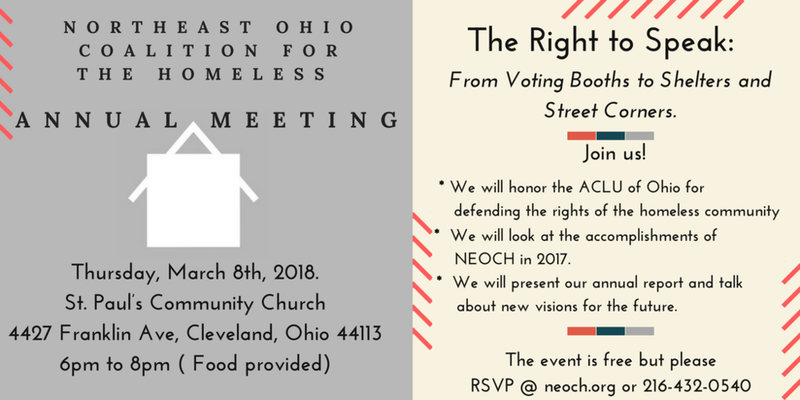 The Northeast Ohio Coalition for the Homeless (NEOCH) believes that participation in the democratic process is critical for those struggling with their housing. For decades, we have worked with Cuyahoga County officials through litigation and organizing to assure that homeless people have access to voting. Our work - and more importantly the fundamental rights of the populations we serve - is at stake in Husted v. A. Philip Randolph Institute, which will be argued before the Supreme Court of the United States today. I have over 10 years of experience working with the homeless community in Cleveland and directing advocacy efforts with the international and local community, and in July 2017, I became NEOCH's director. Since then, my time has been devoted to our mission to organize and empower homeless and at-risk men, women and children to break the cycle of poverty through public education, advocacy and the creation of nurturing environments. My work is about having people experiencing homelessness gain access to the seats and halls of power where decisions that impact them are being made. Because the voting booth is one of the last places that people can turn to change policy, ensuring that our members and the people we serve can participate in the democratic process is at the core of our mission. Over the years, we have conducted voter-registration drives at homeless shelters and drop-in centers, coordinating and providing transportation to the polls, and conducted educational training sessions about how homeless men and women can cast a ballot and have it counted. We know that members of the Northeast Ohio Coalition for the Homeless were purged from the voting rolls. Therefore, speaking out against the practices challenged in the Husted lawsuit - in which NEOCH is a plaintiff - is a necessary piece of our mission and work to ensure long-term success and prevent those struggling with housing from feeling disempowered in our democratic system. Ohio's county boards of elections used a "supplemental process," under the direction of Ohio Secretary of State Jon Husted, that, for example, unfairly purged hundreds of thousands of otherwise eligible voters in 2015 from the Ohio voter rolls who had not voted in an election since 2008. More than 40,000 citizens were removed in Cuyahoga County alone. Furthermore, voters were notified by mail and those who did not affirmatively respond triggered the process, which could lead to their ultimate removal. This process falsely assumed that voters who fail to vote in multiple elections have moved, ignoring the multitude of other reasons someone might not participate in each election. Being un-housed makes life precarious, and getting to the ballot box can be difficult when you are simply struggling to survive. Many members of NEOCH and the people we serve, for example, are frequently on the move and are unable to provide a permanent address at which they would receive such a notice. While Ohio allows such individuals the ability to use intersections and other nontraditional addresses, it makes it that much more difficult to receive notices via mail or ensure that they remain registered to vote prior to elections they wish to cast a ballot in. Furthermore, it is not uncommon for these same individuals to not participate in every single election due to difficult personal circumstances or otherwise unforeseen events. We know that homelessness is difficult, but voting should not be. This process is particularly troubling as Ohio is historically one of the key states that factor into who wins presidential elections. It is critical that the Supreme Court strike down Ohio's illegal process to ensure that all eligible Ohioans can vote, and that other states around the country are not able to remove voters in a similar fashion. Thus, the Ohio voter purge should not just trouble my fellow Ohioans, but all U.S. citizens. I worry that if processes like the one used to remove otherwise eligible Ohio voters are upheld by the court, it will send a clear message to the homeless community that their votes do not matter, and their voices should not be heard. There are already enough barriers for Ohioans - and individuals around the country - struggling with housing day to day; the constitutional right to vote should not be one of those barriers. Voting may not be a priority for each of these individuals at the time of each election, but protecting their right to vote is just as important to their survival as finding housing so that they can have a say in the laws and actions of the United States. Chris Knestrick is director of the Northeast Ohio Coalition for the Homeless. The Street Vendors community lost one of our own this weekend. Melvin “Buzzy” Bryant passed away quietly in his sleep over the Christmas Holiday. He sold the Cleveland Street newspaper for around 20 years and in doing so touched many people’s lives. His smile and eagerness to greet people made him one of the most loved vendors at the West Side Market. He was an incredible person with an amazing story. He was homeless for 10 years, spent time in prison and became a community activist and educator. His lived experience taught him deeply about politics and the need for a deeper sense of community. He brought a deep wisdom to every conversation. He was always looking out for other vendors. When our meetings got tense, Buzzy would step in and mediate disagreements and seek resolutions. His presence will be missed by so many. Buzzy, thank you for wisdom shared. Buzzy was scheduled to sell the paper outside the West side Market on Saturday, December 30th from 10 to noon. In honor of him, Angelo Anderson will sell the paper to raise money for his family in this time of need. Well the election is over and we have a new president, Donald Trump. Let’s review these first 100 days and the state of the country since he has become president of these UNITED STATES. The Dow is still going up, there are a few more people working, we don’t have a new Health Plan, poor people are expecting to become poorer, he still has Russia hanging over his head, and he has hired most of the people close to him and they are now FIRED. It’s like watching The Apprentice in real life, but it’s happening at the White House. His popularity has gone down. So it really hasn’t been a great 100 days for President Trump. I as an American citizen feel upset. Not because I didn’t vote for him, but because from my observation he is running the country like he ran his TV show, The Apprentice. He doesn’t have a clue about how to run a country. I hate to think of the future after Trump. He’s hired all these people with no experience in public service, but all were put in positions that can cripple the United States. They are learning secrets about this country that the average citizen doesn’t know. Who knows what they will use it for once they leave their positions. We already have Bannon saying he can help the president more by his dismissal because of what he has learned being by his side. Now we have a White Nationalist who has obtained secrets about the United States back on the air stirring up more trouble and the United States being torn apart at the seam. Trump supporters are distancing themselves from the president. The country is in disarray. What is it as Americans that we can do or say? Where do we go from here? Can we ever get back to being America? Are we headed down the road of no return? America what will our future hold for our children? These are questions we must begin to answer for ourselves and our children. Something positive has to be done to get America back on the right track. I ask all Americans to stand up for what is right. Let’s get America back to where America needs to be, on top; a country where people want to come, because most of us still believe in Life, Liberty and the Pursuit of Happiness. I just hope that we don’t get into war with North Korea, because more middle to low income people will die for America while upper middle class and rich people stay home and tell the returning soldiers, “Thanks for your service.” Let’s bring back the draft so those who weren’t around can witness how people dodge serving this country in the Armed Forces. As I remember, during the campaign for President Donald Trump’s message was, “Let’s Make America Great Again.” Well how great has he made America? Stand up America. We deserve better; not with force, but with Peace. Until next time, keep the faith. The meeting opened at approximately 1:05p.m., in the St. Peter Room at Bishop Cosgrove Center. After opening the meeting, Chris mentioned that two members of the homeless community had been found dead in the East 23rd and Superior Avenue area. Chris mentioned that usually, everyone in attendance would introduce themselves, however, because of the larger than normal number of attendees, personal introductions would not take place. He did, however introduce Natasha Wynn, NEOCH’s newest outreach trainee. LOH – as the representative for the Homeless Congress at Cuyahoga County Council Meetings and the ADAHMS Board, asked those present to spread the word about Homeless Congress to those unable to attend meetings. LOH – Re: Eden and Frontline: Finally, doing things that should have been done all along because a new provider is coming on board. Norma Herr finally has a microwave, a television, and film on the windows of the shelter, so that people outside can’t see inside the shelter. Will we ever have Wi-Fi? KATIE DONOVAN ONDERS – from the Cleveland Metropolitan Bar Association Homeless Legal Assistance Program (CHLAP), talked a little about what CHLAP is and how it works. Pro bono attorneys will visit homeless shelters to provide legal advice and assistance to homeless and at risk individuals. Attorneys will volunteer at various levels, ranging from intake interviews, providing brief advice, or accepting cases for direct extended representation. Residents at 2100 Lakeside need to be separated by age and situation; because they aren’t situations occur. LARRY BRESSLER -- Organize Ohio, spoke about the number of reports of homeless individuals who had received poor treatment at St. Vincent Charity Hospital. St. Vincent Hospital is the closest hospital to both 2100 and Norma Herr shelters, but homeless people are treated badly there. Example: A resident of 2100 Lakeside who had been “examined” following an assault, was given pills and discharged from St. Vincent, only to later discover that he had broken bones that had not been dealt with. Mr. Bressler asked that Homeless Congress members join with United Clevelanders Against Poverty Poor People’s Campaign, which meets once a month on Thursdays. The next meeting is January 11, 2018. At this meeting, the testimonies of homeless individuals who’ve been mistreated by St. Vincent will be collected. ERIC AND HEIDI – Cleveland Federal Community Leadership Institute They are participating in a project to gather information about issues that a certain population such as the homeless, or veterans, or youth, or aging people face every day. Working on a small scale and with no budget, Eric and Heidi’s goal is find out what they can do to help the homeless with issues such as: finding employment, finding God (spirituality), financial literacy, housing obstacles due to felonies. METANOIA: Will be open Fridays, Saturdays, Sundays and Mondays. Please spread the word to others living on the street so that they know that Metanoia is a safe place they can go to to get out of the cold. NEXT MEETING: Thursday, January 11, 2018, to be facilitated by Joyce Robinson and Vishal Reddy, as Chris will be in Washington, D.C.
Last night I ate chicken wings from the garbage can on 4th street it’s a good place to find doggie bags from the restaurants on that street. I walked over to the alley next to May Company, got in the corner and slept.